I remember reading years ago that the US killed a third of all Koreans and destroyed every third house during the Korean War which they started. But hey they must be the bad guys still because they hate our way of life like Al Qaeda right? In the North Korean capitol, Pyongyang, just two buildings were reported as still standing". Not really interested whether Vets today is a CIA front the information is still real. Interesting and not at all surprising. For those who believe in the existence of nuclear weapons (I do not) 'North Korea-scare' is a great psych-op! I wonder what the NWO plan is here? Invasion? Does N Korea lack a private central bank that is part of the global usury banking 'system'? Perhaps N Korea may be the proof that Nukes exist Michael? So if they don't get laid to waste again one might argue Nukes do in fact exist. We will soon see if N. Korea has nukes. If they are attacked they will release everything they have. What needs to happen is the US to pull up a chair and talk to them properly. Then pull out of the south, and help both sides peacefully...Ain't going to happen. My point here is that MSM have removed any historical context from the narrative. They never mention the Genocide of the Koreans. If the US killed a third of your entire nation it would be "Normal" or at least understandable that you hated them. Yet they are presented as crazy. The US sanctions on N Korea are similar to that of Japan before Pearl Harbour. Not really sure about the origin of 'communist' N Korea. Was it started and still owned by the same international usury banking criminals who took Russia in 1917 and still own it? Then why did these same criminals, through their stooges(aka US government) attack N Korea in 1950? Posted: Thu Sep 07, 2017 4:35 pm Post subject: North Korea: What can actually be done? 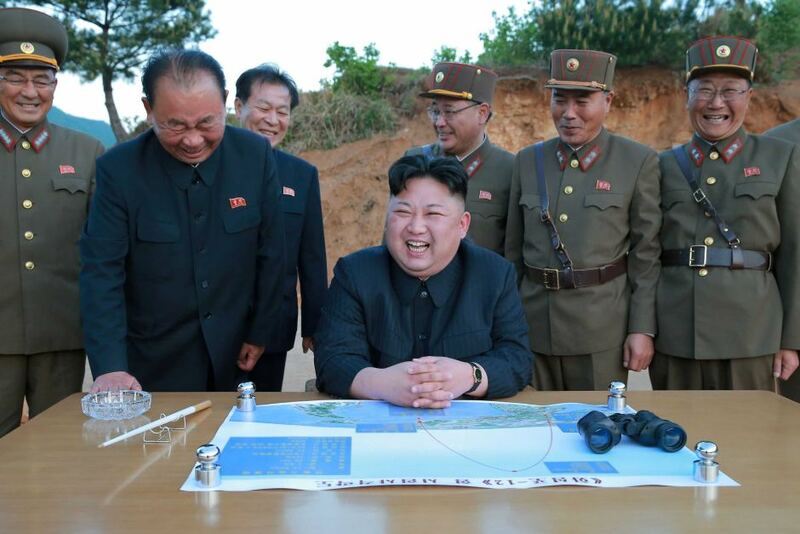 North Korea: What can actually be done to deal with a nuclear Pyongyang? From the first tweak of the seismograph it was clear this was no ordinary tremor — it signalled the most powerful bomb of all. The North Korean TV newsreader announced with a flourish this was the state's first hydrogen bomb. If that now means Pyongyang has the weapon and the delivery system that could wipe out a Los Angeles, a San Francisco or a Sydney in a flash, then the world is now a different place. Nuclear weapons are supposed to be a deterrent — make yourself so dangerous no-one will ever dare challenge you. Clearly the thinking for three generations of Kim is that the regime is made safe if everyone fears you. And the clear impression you are crazy helps too — no-one wants to aggravate a disturbed mind. But what to do? US President Donald Trump has described the test as hostile and dangerous and said Pyongyang "only understands one thing". Think back to the 'red scares' of the 1950s and 1960s and the 'atom bomb scares' from same period. The Master criminals are running out of new tricks to deceive you and so are recycling some some old tired CIA disinfo rags from 50 years ago on the theory that the present generation would not remember the past. Why did these same criminals, through their stooges(aka US government) attack N Korea in 1950? If N Korea is a Nuclear Power and because of this it protects its people then one could argue that "Nukes Exist & Nukes are Good"
Maybe in years to come the world will have its own Constitution. With the 2nd amendment being the right of every nation to have Nukes. I don't believe the other "Earth is flat" CIA Hoax for a Minute Michael. Has anyone researched the banking system in N Korea?